Our Saturday, April 14, 2018, our featured speaker will be Mr. Dave Racer. Dave is a writer, researcher, publisher, speaker, and teacher. As such, he has written and/or edited 48 books, of which 18 focus on health care and health finance issues. Dave has spoken in more than 25 states and all across Minnesota as a keynoter or educator about health care, and a broad array of issues and ideas. Since 1999, Dave has taught “American Government-For Real!! and Student Senate at YEAH Academy. Dave is the former President and Board Chair of The Constitution Educational Foundation, and the Founding President of The Declaration Foundation. He continues to write and publish books and articles about American liberty, the Declaration, and the Constitution. The above is from Mr. Racer’s website. The WCR will welcome Bill Poehler, the Director of the Minnesota Citizens Concerned for Life, as the March 3, 2018 speaker. The title of his talk will be “2018: A Big Year For Life”. The Minnesota Citizens Concerned for Life (MCCL) is Minnesota’s oldest and largest pro-life organization. MCCL defends the equal dignity and right to life of every member of the human family—including unborn children, pregnant women, and persons who are elderly, sick, and disabled—and opposes the killing of innocent human beings through abortion, infanticide, euthanasia, assisted suicide, and embryo-destructive research. 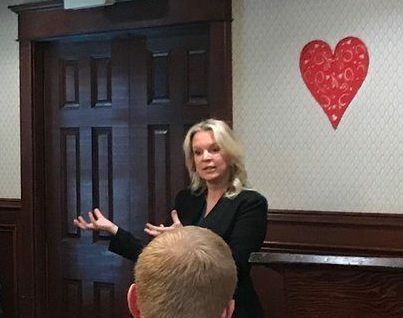 Karin Housley, U.S. Senate candidate for the November 2018 elections, attended the WCR breakfast at The Lake Elmo Inn as the featured speaker. Housley believes that taxpayers should be respected, veterans should be remembered, and seniors should be properly cared for. As Senator and Chair of the Aging and Long Term Care Committee, Karin fought to keep our seniors safe and eliminate government waste. Karin is aware that government regulations make it difficult for businesses to thrive. She understands that businesses need to be supported as they create jobs for our citizens. Small businesses need lower taxes and fewer government obstacles to succeed. Improving and repairing our infrastructure so that it is safe as well as serviceable to all citizens is another issue for Housley. She is excited for Minnesota citizens who are benefiting from Trump’s tax reform. Housley believes that we need to hit the pause button on immigration: we need to find out who is here before we move forward. She supports building the wall and securing our borders. Housley currently represents Senate District 39, which includes Stillwater, Forest Lake, Lake Elmo, Bayport, Oak Park Heights and the surrounding St. Croix Valley. She now serves as chairwoman of the Aging and Long-Term Care committee, Vice-Chair of the Commerce and Consumer Protection Committee and serves on the Veterans and Military Affairs, and Jobs and Economic Growth Committees.